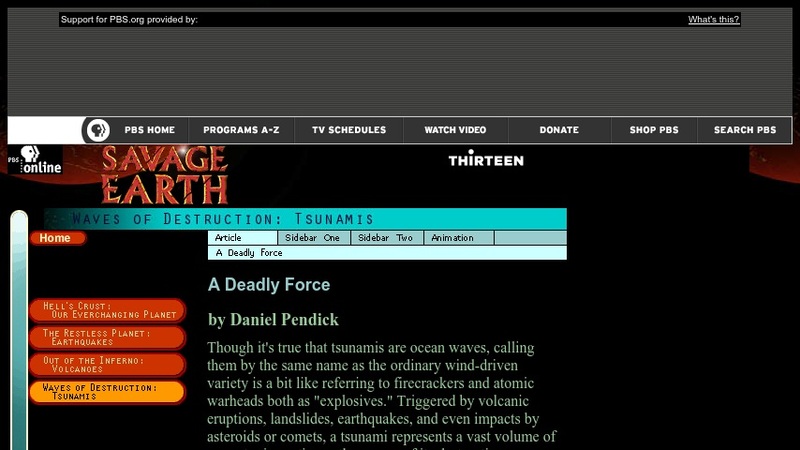 This is a set of interactive articles on tsunamis developed to accompany the Savage Earth television series on PBS. The three articles explain the anatomy of a tsunami and how it differs from typical wind-generated water waves. Animations and illustrations help users understand how these waves are generated and why they can be so destructive upon reaching a shoreline. A history of tsunami events is woven throughout the articles, including a video interview with a tsunami survivor. SEE RELATED ITEMS ON THIS PAGE for a link to the full collection of materials developed by WNET-TV to accompany Savage Earth. By the end of grade 12, read and comprehend science/technical texts in the grades 11—CCR text complexity band independently and proficiently.